Welcome to the final stretch of 2014! In case you missed it, here is a summary of features we raced the Holiday shopping rush to release for you in October, and what’s left on the horizon before the New Year. Enhanced Sitelinks means a larger, more relevant and descriptive ad, and a more captivating ad format by which to attract your target audience. 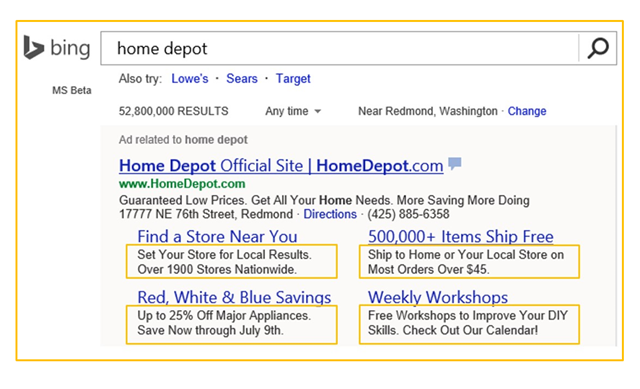 Add Enhanced Sitelinks to your online advertisement to attract searchers to a specific landing page, and take advantage of the two extra lines of customizable text to inspire their visit! In early October we completed a phased approach to combine tablets and PCs into a single device target, with a range of bid adjustments available between +300% and -20%. For more information, visit these Frequently Asked Questionsabout Unified Device Targeting. Want to see whether changes you’ve made to your campaign had an impact on its performance? Visit the Change History Page to find out! Thanks to your feedback, we’ve fine-tuned this feature over two rounds of improvements, with performance and scale enhancements in August, and usability and workflow in October. Visit this this Help article to learn more about using Change History. Universal Event Tracking (UET) is a new solution from Bing Ads for tracking your sites’ activities. By using just one tag across your site, you can define and track performance measuring the success of your search advertising campaigns. 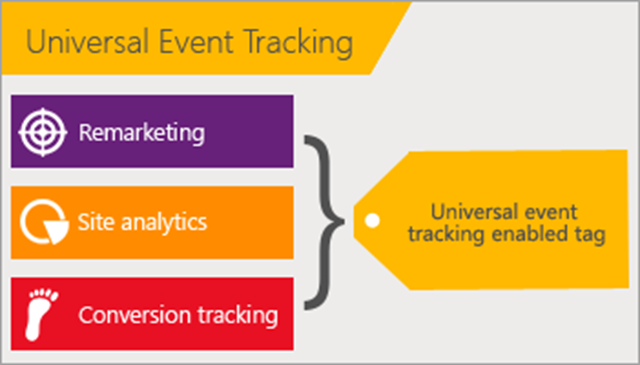 UET replaces Campaign Analytics conversion tracking and also lays the groundwork necessary for audience-based remarketing. Visit this Help article for details and instructions for using UET. The new Accounts Summary page provides a central location for managing multiple accounts (up to 2,000), making it easy to switch between accounts and review top metrics. If you are currently an advertiser with more than one Bing Ads account, you’ll now see the Accounts Summary page when you sign into Bing Ads. The new Opportunities page gives your personalized optimization opportunities, their estimated impact to clicks and impressions, and a recommended course of action. In addition to rolling this feature out globally, we’ve also fine-tuned your experience by delivering on four user-requested updates– thank you for your feedback! To get started, visit our Help Center article on how to Use Bing Ads Opportunities for ideas to improve your campaign. You’ll find campaign management easier and more efficient in the new version of Editor, thanks to easier navigation, enhanced negative keyword lists, and a simpler campaign import process. 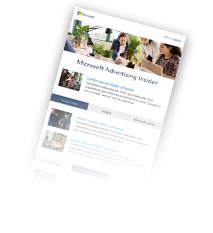 Visit the Bing Ads Editor download center to get started. We appreciate your support and input – and most importantly, your partnership in shaping the tools you need to succeed on the Yahoo Bing Network. We’ll have updates to share around Campaign Planner, annotations, auction insights, and potentially a surprise or two before the end of the year. So stay tuned! Comments? Questions? Please leave them below, visit our Feature Suggestion Forum, or reach out to us on Twitter or Facebook.